Smartphones these days come packed with high-end cameras that make video recording quick and easy. So if you have recorded multiple videos on your phone or other device and want to watch them on a DVD player, a video to DVD converter is what you need. Additionally, moving your videos to DVD also creates some space on your phone or PC hard drive for other documents. If you want to know in detail about a professional or free video to DVD converter, you are on the right page. 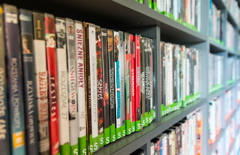 Read below to know about various video to DVD tools. If you love perfection in all your tasks including DVD burning, Wondershare DVD Creator must be your pick. This is an expert and the best video to DVD converter that converts your videos and other files to DVD and Blu-ray discs effortlessly. The software can be safely downloaded and installed on your Windows 10/8/7/Vista/XP/2003 and Mac system. Listed below are the major features of this video to DVD service tool. · Toolbox with functions of Data Disc, ISO to DVD, DVD to Video, One-click to Burn Disc, Video Editor, Slideshow Maker, etc. · Customize DVD menu with different parameters like title, music etc. · Offer 100+ free static and dynamic menu templates, like Sport, Family life, Standard, Holiday and other category. 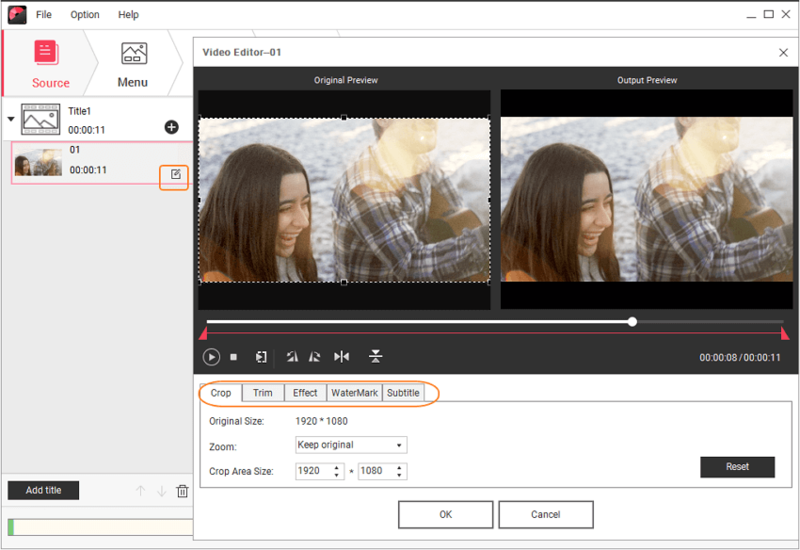 · Build-in editor to personalize videos by Trim, Crop, Add subtitles/watermark, etc. Step 1 Install and launch Video to DVD converter. 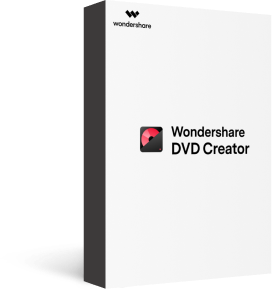 Run Wondershare DVD Creator on your PC. Select the option Create a DVD Video Disc from the window. Step 2 Import video files to video to DVD transfer service. Go to the Source tab, and click the + icon to add videos. You can also drag and drop the files to the DVD converter directly. Multiple files can be added here. Step 3 Edit videos before the video to DVD service (Optional). For video editing, click the pencil icon beside the added video thumbnail to open the Video Editor window. You can also right-click on the video and choose the Edit option. Select from one of the tabs: Crop, Trim, Effect, Watermark or Subtitle and then make changes, click OK to confirm the settings. Step 4 Choose DVD template on Video to DVD tool. Select the Menu tab. The software shows the DVD menu template designs. Scroll down the bar to check the available designs. Click the download icon to download more templates. 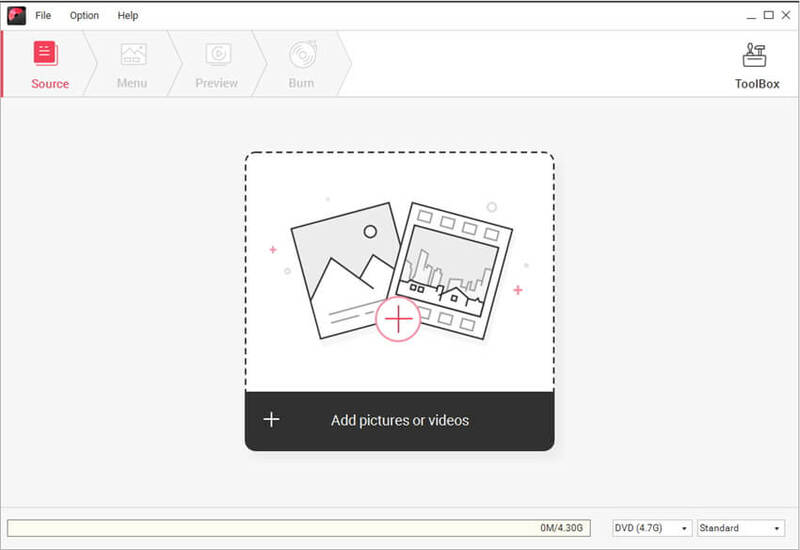 Additionally, there are options to customize templates like setting aspect ratio, adding background music or image, creating chapters, and others by clicking the icons at the top panel. Step 5 Preview and transfer video to DVD. Click the Preview tab to check your DVD creation. Next, go to the Burn tab, and select the Burn to disc option from the Burn Settings window. Enter Disc Label and other parameters. Click the Burn button to burn video to DVD. If you're looking for options on how to burn video to DVD on Mac? Use Wondershare DVD Creator for Mac and files will be burned at super fast speed. Enlisted below are 3 popularly used video to DVD converters that can be considered. This is another professional software from Wondershare to burn video to DVD and blu-ray discs. It supports almost all major video, audio, and image formats including SD and HD files. Based on the free templates available you can set DVD menu templates as per your disc theme. Background image or music can also be added to make DVD look professional. There is also an option to adjust the font, size, and other parameters of the DVD title. Built-in video editor helps in video personalization before burning to a DVD. 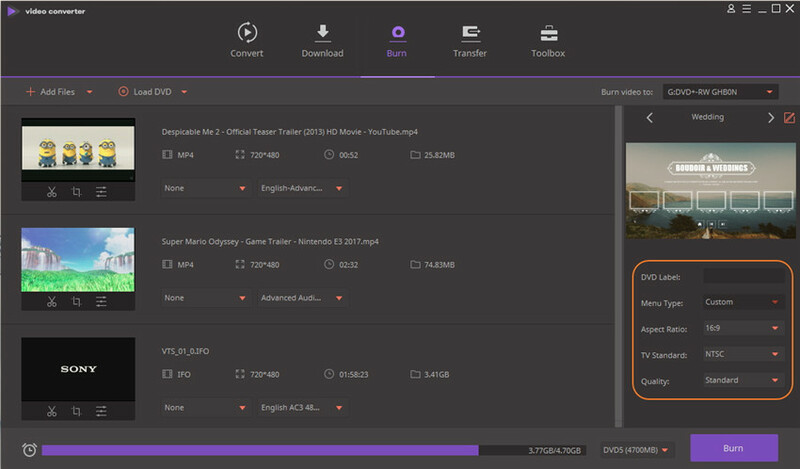 With just a few simple clicks, you can burn multiple DVDs in no time. Fast burning speed, real-time preview, and intuitive interface are additional features. Supports more than 1000 formats. In addition to DVD burning, it also facilitates video conversion, video transfer and download. Comes with free DVD menu templates with customization options. Limited option for DVD templates and customization option as compared to DVD Creator. This is a free video to DVD converter and burner that features simple interface with basic needed functions. The software facilitates converting all major video formats to DVD disc. Multiple videos can be burned to one disc and a simple DVD menu is also created automatically. It also has a feature where size of the future DVD folder can be detected. Free Video to DVD Converter comes without any adware or spyware and is thus safe to download and install. Support all popular video file formats. Does not have a Mac version. No option to customize video templates. This is another known tool to convert video to DVD format. The software is basically a video converter that supports over 180 file formats. 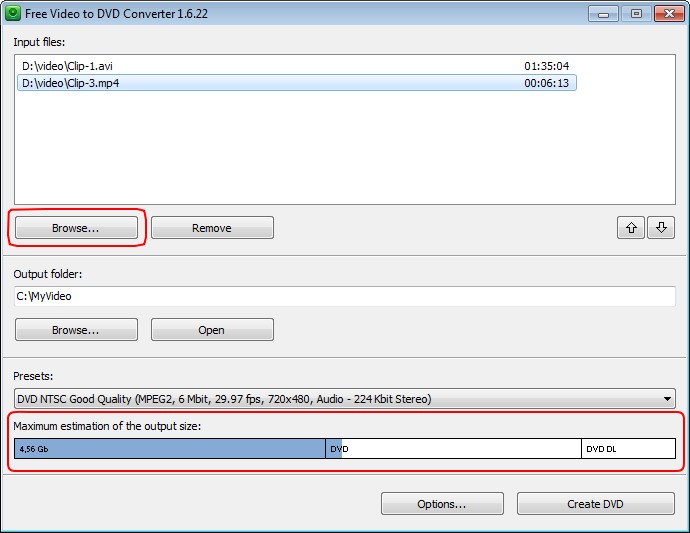 Using the software, you can select a DVD compatible format as output file. Using Movavi, you can encode the videos in PAL or NTSC standards as needed. There is also a feature to select file quality from high, medium or low options. If you want to burn your DVD compatible format file to a disc, use Movavi Video Suite. Movavi Video Converter is compatible working on Windows and Mac system. Supports all major video formats. No option for DVD menu template or its customization. Converts videos to DVD compatible format instead of DVD. There are different tools for putting videos onto DVD and depending on what are your priorities and requirements, you can select a program. 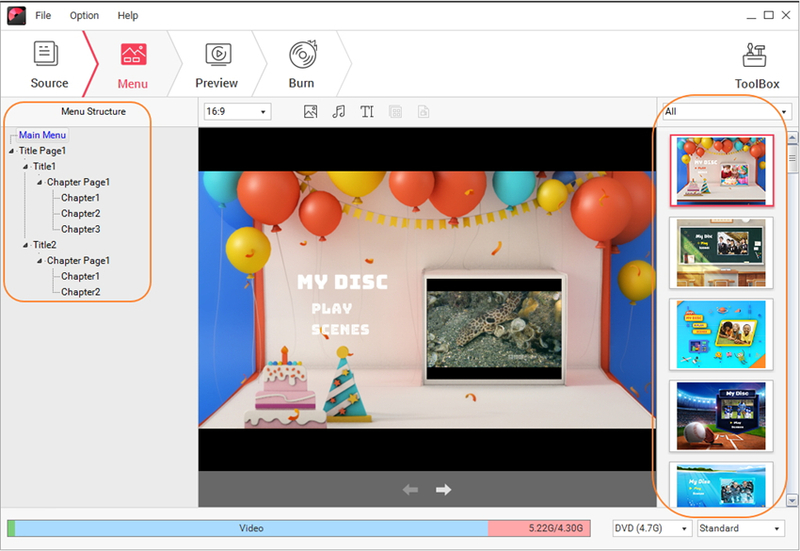 The table below compares Wondershare DVD Creator with 3 other video to DVD tools.